Would you like to meet a women from Western Ukraine? Then go to Lutsk! Lutsk is one of the most ancient towns of Ukraine. In the past it suffered from trials and offered heroic resistance to the Polish, Lithuanian, Astro-Hungarian and Swedish lords. A medieval Lubart castle, an architectural monument of the 15th century, will impress you a lot. Lutsk is a perfect place to meet you beloved person! 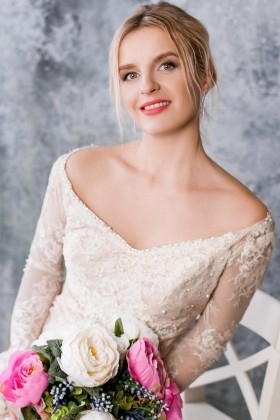 A matrimonial agency UaDreams offers you to meet women from Lutsk. Meet the girls online, and them come to see one of the most beautiful towns of Western Ukraine! Are you interested in women from Lutsk? They are beautiful and tender. It is no wonder that they are romantic and creative, because a great Ukrainian poetress Lesya Ukrainka came from Lutsk. How can girls brought up on her wonderful poems have not a sensitive soul? People in Lutsk and throughout the region revere the memory of their famous compatriot and show their respect for the poetess by naming streets, parks and libraries after her. A girl from Lutsk — who is she? She is smart, open and educated. Ukrainian women are beauties in their majority. They have a specific Slavic beauty that the whole world talks about. If they are not beautiful, they are always pretty. They know how to take care of themselves. Lutsk women are mostly Catholics. Their native language is Ukrainian. They are modern and lovely. Join UaDreams.com to meet women from Lutsk! In the Gallery of Ladies you will find profiles of women from many cities of Ukraine. A lot of men think that Ukrainian girls on dating sites need only money. However, UaDreams.com provides a strict policy that prohibits women to ask men for money and take money from men. Men aren't allowed to send money to women. If a case takes place, the girl is immediately excluded from the agency and her profile is deleted. In such a way you can feel completely safe being a member of UaDreams.com. If you want to choose ladies from Lutsk in the Gallery of Ladies, use Advanced search. Choose the city you need or any other parameters you are interested in. You can also choose hair color, eyes color, weight, height etc. Of course, you can change age of women in the search field. See photos of ladies in their profiles and enjoy their videos. They are smiling to you on each photo!